Toymaker Hasbro moved beyond its target audience of kids when the Rhode Island-based company launched its first product designed for elderly loved ones—the Joy for All Companion Pet Cat. The animatronic cats, first rolled out two years ago by the makers of Monopoly, My Little Pony and G.I. Joe, use built-in sensors to respond to petting, hugging and motion. They make authentic cat sounds and have soft fur. Those original pet cats proved so popular among the senior community that Hasbro has now released a companion pet pup that barks in response to hearing your voice. 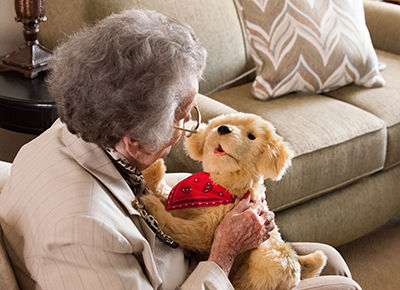 ​And now, with help from Brown University, Hasbro hopes to add artificial intelligence capabilities to the pets so they can help older adults with simple tasks. A $1-million grant from the National Science Foundation announced in November 2017 is funding the three-year partnership. Computer and social science researchers plan to develop a prototype that can assist in finding lost objects, medication reminders and other tasks, complementing the work of caregivers. ​The Hebrew Home at Riverdale in the Bronx has been utilizing the pets since their launch and has about 60 that are used across the spectrum—from helping calm patients with dementia when symptoms worsen in the evenings to keeping lonely residents company. ​The cats, available in orange tabby, creamy white and silver, cost about $100, and the golden dogs about $120. My son in law was on the team at Hasbro that developed the Joy For All Pets. Perhaps you can suggest to the facility your sister is in to invest in buying one for the facility so all patients can derive the benefit.